One of the best established findings in the psychological literature on aggressive and violent behavior is that violence begets violence. This contagion of violence appears to be a universal phenomenon. The contagion of violence occurs within families. Violence between partners increases the risk of violence directed at children and increases the risk of the children behaving violently themselves. Having one violent individual in a family makes it more likely there will be others. It is true within peer-groups. Violence by some peers increases the risk of violence by other peers. Violence by peers directed outward not only stimulates violence by others that is directed outward, but stimulates violence between peers within the group. It is true in neighborhoods and communities. Violent communities and neighborhoods breed violence in those who join the community or neighborhood. Introducing violence into a community increases the risk of greater violence throughout the community. It even appears to be true within nations and cultures. And it is true across generations. Children catch it from their parents, and parents can catch it from their children. Violence is highly contagious. It is not only spread from the perpetrators of violence to the victims, it is spread to the onlookers and observers of violence. It is not surprising that violent victimization leads to violent retaliation within and between families, peer groups, schools, communities, ethnic groups, cultures, and countries. What may be more surprising to some is that simply the observation of violence also leads to increased violence within and between all this groups. Violence can even be spread to far away people who observe violence at a distance. The boundaries of time and space that apply to most biological contagions do not apply to the contagion of violence. Why is it so contagious and how does it spread? What psychological processes are involved? How could the spread be halted? These are some of the questions I would like to address in this essay. Severe violent behavior is almost always the product of predisposing individual differences and precipitating situational factors (Huesmann, 1998). One important environmental experience that contributes both to predisposing a person to behave more violently in the long run and to precipitating violent behavior in the short run is the observation of violence. Psychological theories that have emerged over the past few decades now explain the short-term precipitating effects mostly in terms of priming, simple imitation, and excitation transfer. Priming is the neurological process through which seeing violence produces a spreading activation in the neurons of the brain that activates all sorts of ideas related to violence making violence more likely. Imitation of violence in the short run occurs because human beings, from a very young age, have a wired-in tendency to mimic whatever they see. Excitation transfer means that, when someone provokes us, we feel more angry if we have recently been aroused and made angry by something we observed, such as violence. 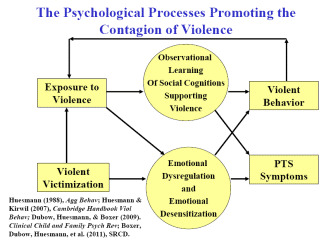 The long-term predisposing effects of observing violence, however, involve more complex processes of observational learning of cognitions and of emotional desensitization. Obviously being victimized always also includes observing violence – part of the mind of the child who is being spanked or the youth who is being beaten up is observing the interaction while another part is suffering from the interaction. Although the emotional reactions to victimization may be more intense and immediate, observation alone also produces both intense emotional and intense cognitive reactions that can have long-term effects on a person’s mental health (e.g., post-traumatic-stress symptoms) and behavior problems (e.g., violent behavior). This is diagrammed below. Huesmann (1988), Agg Behav; Huesmann & Kirwil (2007), Cambridge Handbook Viol Behav; Dubow, Huesmann, & Boxer (2009). Clinical Child and Family Psych Rev; Boxer, Dubow, Huesmann, et al. (2011), SRCD. Before I elaborate on these processes for the contagion of violence in more detail, I want to present an example of the phenomenon of contagion of violence through observation. Probably no children in the world are exposed to more violence on a day in and day out basis than those who live in regions of war and ethnic violence. They are regularly exposed to scenes of extreme human violence at rates that would be hard to find even in American’s most violent ghettos. My research team has just finished collecting data on children in one such region – Palestine (West Bank and Gazza) and Israel (Israeli Jewish and Arab communities). We have interviewed 600 Palestinian, 450 Arab Israeli, and 450 Jewish Israeli children and their parents individually three times at one-year intervals from 2007 to 2010. At the start of the interviews the children were either 8, 11, or 14 years old. Each year we asked the children and their parents to report on how much violence they had been exposed to in the past year. For example, we asked, “How often have you seen right in front of you Palestinian (or Israeli for Israeli children) buildings or buses or other property destroyed by Israelis (or Palestinians for Israeli children).” We asked many questions of this type including about “seeing a family member die,” “seeing friends die,” “seeing them injured,” “seeing them held hostage or tortured,” etc. The rates of observation in person were very high – for example, 55% of Palestinian children had seen a friend die due to the Israelis, 43% had seen someone tortured or held hostage, and 63% had seen someone crying because someone they knew had died. The rates of seeing such things rose to over 90% for the past year when observing in the mass media was included. The rates for Israeli Jewish children were about half as much and for Israeli Arab children half as much again, but even among them about one out of every 20 children had seen someone killed or be seriously injured in front of them in the past year. These rates are appallingly high. The question is does such exposure to such violence increase the aggressive and violent behavior of the children subsequently? The answer, we discovered, is clearly yes. The violence spreads like a contagious disease among them. 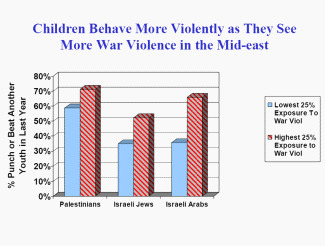 For example, as shown in the figure below, Palestinian kids and Israeli Jewish kids who fall in the top 25% on the amount of war violence they have seen in one year are 15% more likely to punch or beat a peer than kids who fall in the lowest 25% on violence exposure, and Arab Israeli youth in the highest quartile on exposure are about 30% more likely to punch or beat a peer during the year. These youth have not been victimized by their peers; yet they attack their peers. In fact, we found that those who are in the highest 25% on exposure are also significantly more likely to go beyond ‘punching’ and commit very serious acts of violence against their peers including using knives or guns on their peers. These results cannot be explained by demographic differences, age differences, or gender differences. Differences in exposure to violence account for more of the individual differences in aggression than any other single factor. Because we collected the data over three years, we can also rule out the idea that more violent or aggressive youth expose themselves to more war violence. No, the direction of the effect is clearly that exposure to violence stimulates later increases in aggression even after we control for initial differences in aggression. 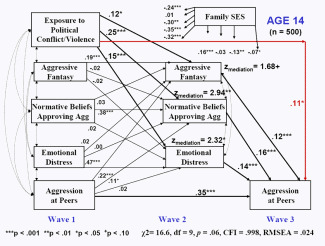 For example, for 8 and 11 year olds the causal path coefficients from exposure to violence in year 1 of the study to change in aggression from year 1 to year 3 are about .30 while the causal path coefficients from aggression in wave 1 to increases in exposure to war violence between wave 1 and wave 3 are about 0. For the oldest cohort only there is some evidence that aggression makes later exposure more likely, but it is significantly smaller than the effect that exposure has on later aggression. What produces this kind of contagion of violence over time? The contagion is promoted by the fact that children grow up in an ecology of nested spheres of influence in which, as Bronfenbrenner (1979) and Sameroff (2010) have pointed out, macro-environments like war settings influence micro-environments like the family which in turn affect the child who in turn affects the micro-environments around him or her. Children are most directly influenced by a micro-system of influences that are close to them – most notably family and peers. However, family and peers in turn are influenced by the schools and communities in which they reside, and those in turn are influenced by more distal systems such as the ethno-political culture, the mass media, and the country. These ecological systems are not independent. Each influences and is influenced by the systems within which it is nested and by the systems nested within it. Thus, violence or non-violence in a country influences violence in communities and subcultures which influences violence in schools and families which influences violence in youth. This is exactly what we have found in our study of Palestinian and Israeli youth. In regions where more war violence occurs, we found more intra-community violence and more intra-family violence. These in turn stimulate more youth violence. However, this ecological proximity effect does not explain why violence is so contagious that it is spread by observation alone, even if the observation is at some physical distance. The answer to this puzzle is provided by the way that the human information processing system has evolved to make humans adaptive for survival – in particular by evolving mechanisms for encoding cognitive scripts to imitate observed behaviors of others (observational learning) and by evolving mechanisms for adaptation to emotionally disturbing environments to reduce the stress they produce (desensitization). We know that all social behavior is guided by encoded scripts (programs for behavior) that we all have acquired as we grew up. When confronted with a social problem, youths first make attributions about what is going on in the situation and then retrieve from their minds whatever social scripts are most easily recalled and seem most relevant. These generally are scripts that are most strongly primed by the social situation and have been most strongly learned from past experiences. Thus, a boy who has grown up observing violence around him almost every day (whether war violence, neighborhood violence, gang violence, school violence, or family violence) will believe that the world is a hostile place and will be biased toward making hostile attributions about those who annoy him. Such attributions and the repertoire of aggressive scripts the boy will have encoded over time will then make it more likely that he will use an aggressive social script for dealing with such a person. Additionally, he will be more likely to view behaving in such an aggressive manner as normative and acceptable. Equally importantly, repeated exposures to violence will blunt the negative emotional responses (anxiety and fear) that humans normally experience when they see violence or think about violence. What will remain is the angry emotional distress which through excitation transfer can exacerbate the youth’s tendency to behave aggressively. Thus, the more a youth is exposed to war violence, the more likely he or she is to behave violently toward others, even though the others may have no connection to the war violence. This process is illustrated in the figure below taken from our recent study of Palestinian and Israeli youth. The numbers in this diagram show the strength we found for the causal effects represented by the arrows. The 14-year-olds in this diagram who have been exposed to the most political conflict/violence in year 1 fantasized more about behaving aggressively in year 2 (that is, they rehearse aggressive scripts more), held stronger beliefs that aggressive behavior at others is OK in year 2, and showed higher levels of emotional distress in year 2. Each of these effects in turn stimulated them to behave more aggressively at their peers in year 3. Violence is clearly contagious. While being victimized by violence promotes more violence, all that is really required is viewing violence. There are now many other examples in the scientific literature, besides the one shown above, that demonstrate how habitual observation of violence by youth leads to behaving more aggressively. Violence is contagious in multiple contexts. It is contagious in the short run and in the long run. The contagion is mediated both by changes in emotions and changes in cognitions caused by repeated exposures to violence. These neurological and psychological reactions are ‘wired-in’ and probably evolutionarily adaptive. Consequently, it is difficult to intervene to prevent the contagion of violence other than by preventing the observation of violence. However, the most promising additional interventions would undoubtedly be those that are directed at counteracting the changes in cognitive and emotional processing that observation of violence engenders. Bargh, J.A., & Chartrand, T.L. (1999). The unbearable automaticity of being. American Psychologist, 54(7), 462-479. Berkowitz, L. (1993). Aggression: It’s causes, consequences, and control. New York: McGraw-Hill. Cialdini, R. B. (2001). Influence: Science and Practice (4th ed.). Needham Heights, MA: Allyn & bacon. Dodge, K. A., Price, J. M., Bachorowski, J. A. & Newman, J.P. (1990). Hostile attributional biases in severely aggressive adolescents. Journal of Abnormal Psychology, 99, 385-392. Dodge, K.A. (1986). A social information processing model of social competence in children. In M. Perlmutter (Ed. ), The Minnesota Symposium on Child Psychology, 18, 77-125. Hillsdale, NJ: Erlbaum. Dollard, J., Doob, L. W., Miller, N. E., Mower, O. H., & Sears, R. R. (1939). Frustration and aggression. New Haven: Yale University Press. Farrington, D. P. (1997). The relationship between low resting heart rate and violence. In A. Raine, P.A. Brennan, D. P. Farrington & S.A. Mednick (Eds.) Biosocial bases of violence (89-106). New York: Plenum Press. Huesmann, L.R. & Guerra, N.G. (1997). Children’s normative beliefs about aggression and aggressive behavior. Journal of Personality and Social Psychology, 72, 408-419. Huesmann, L.R. (1988). An information processing model for the development of aggression. Aggressive Behavior, 14, 13-24. Huesmann, L.R. (1998). The role of social information processing and cognitive schemas in the acquisition and maintenance of habitual aggressive behavior. In R.G. Geen & E. Donnerstein (Eds. ), Human aggression: Theories, research, and implications for policy (73-109). New York: Academic Press. Sameroff, A.J. (2010). A unified theory of development: A dialectic integration of nature and nurture. Child Development, 81, 6-22.